For today’s Free For All Challenge (F4A145), we are to use fruits or veggies or colors of fruits or veggies. So ok, this may be stretching things a tad, but pine cones are fruits and so are the holly berries. Or I guess I could go w/ the colors rhubarb and celery. Anyway, that’s my story and I’m sticking to it because I really need to make some more Christmas cards. The images are all from Our Daily Bread designs and are a mix of new and older and I pretty much gold embossed everything except the background. The chickadee image is from the new Chickadee Ornament and since I wanted to put it on my wreath, I fussy cut it out. The Apple Wreath (minus the apples) was embossed on a die cut circle. The pine cones (from Sing for Joy), were also embossed and fussy cut. I attached my wreath on top of a Wood Background I stamped w/ the sand ink. 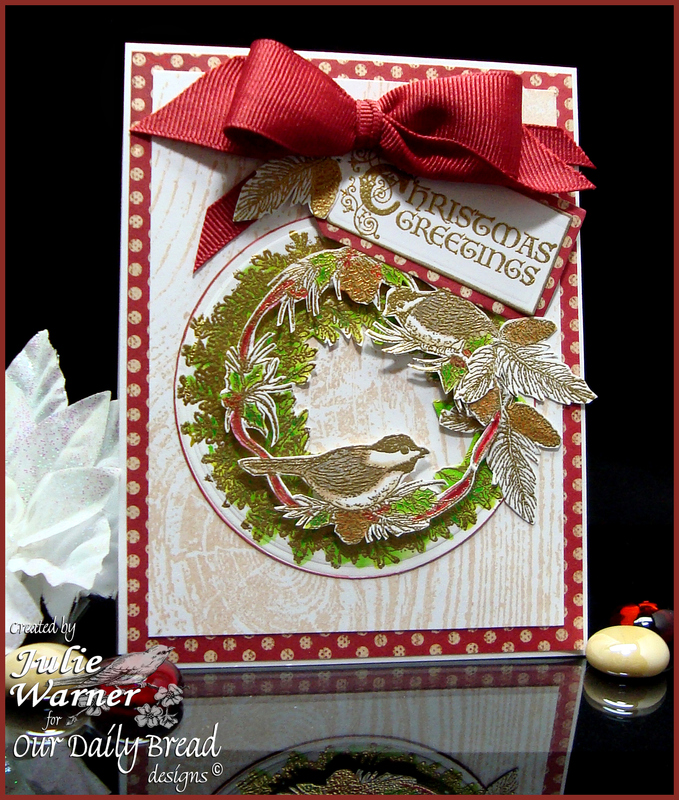 The greeting (from Christmas Flourished Verses) was die cut w/ a tag die. A bow and some designer paper finished my 4.25 x 5.50 card. For the Color Challenge (CC403) on Splitcoast, we are to use green, red & gray. My CAS card is a lot of white, green, a little red and a tiny bit of gray. Actually, I only used the gray to shade the lamp post. The images are all new from DRS Designs. For the rest of my card, I die cut a couple of flourished holly out of the green then used the negative, or leftover part for my background. The large white frame was also a leftover from cutting a larger label shape out for another card. I used markers to color the rubber of the sentiment in two colors, and the rest of the sentiment says “and the happiest Happy New Year” so I put that part on the inside since I could only fit this much on my little die cut label. The lamp post was colored w/ copics and cut out. 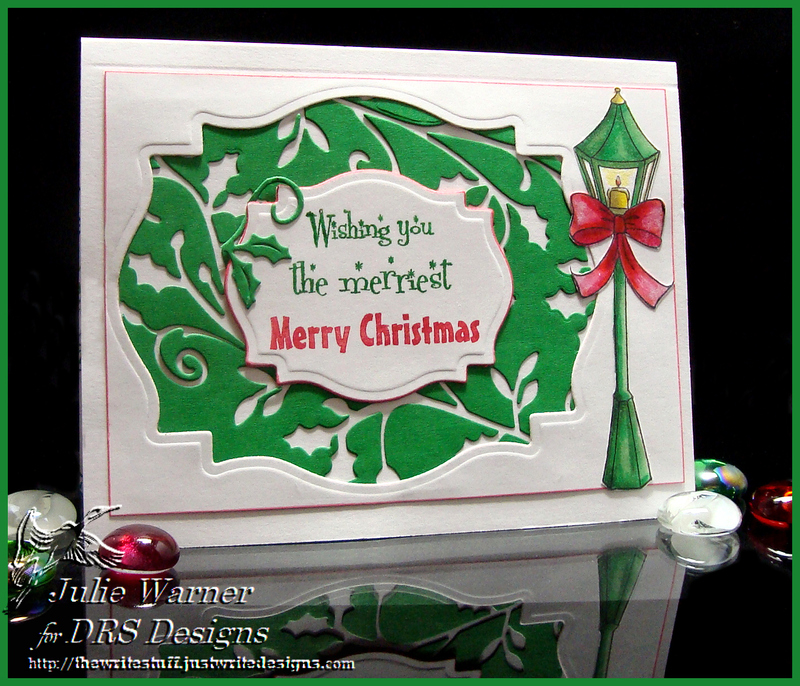 I just love the traditional Christmas colors and festive look of the sentiment and lamp post. A big CONGRATS to Allison, the Featured Stamper (FS303) on Splitcoast this week! What a super gallery she has! After much browsing, I kept coming back to her Celebrate the Season card. I kept the Christmas theme, the plaid and layout but I used different images, made my own plaid background (instead of using designer paper) and used a different die cut for my frame. The images are all from DRS Designs. I stamped the main image twice on white card stock, colored them w/ Copics and cut out the just the holly leaves on one to attach on top of the matching area on the base image. After die cutting my frame, I used a Copic marker to add some color inbetween the two dies on the raised area. I used the plaid maker stamps and inks and a red Tombow marker to make my plaid background. The cut out image was attached on top of my frame w/ a die cut fancy lattice behind it and a dark red piece of card stock behind it. 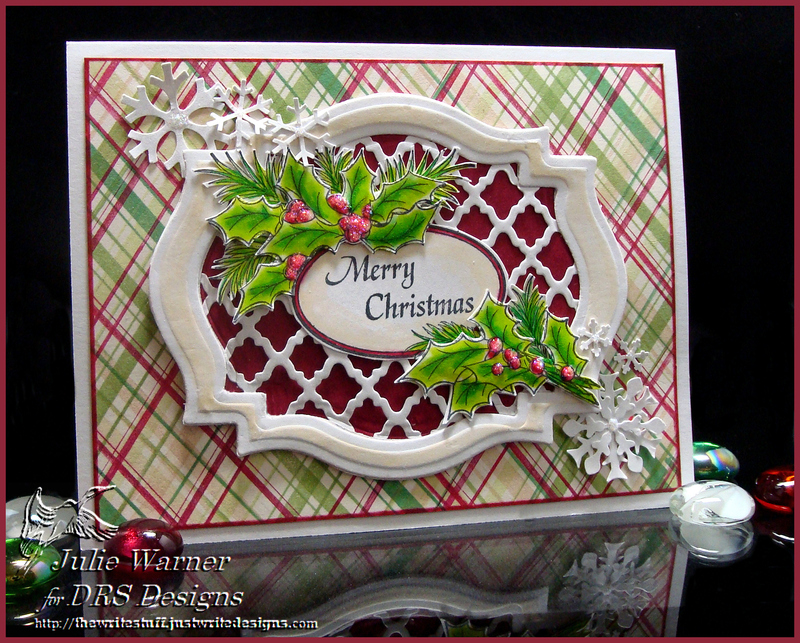 A few punched snowflakes were added in opposite corners and my 5.50 x 4.25 card was finished.